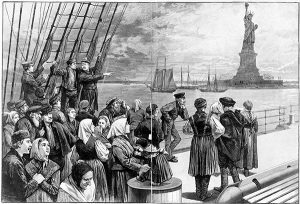 Lines of immigrants at Ellis Island are a thing of the past. Immigration law in America is altering rapidly under the new government. Do you dare try to keep up with all these changes yourself? The Trump government has been making headlines for their attempts at sweeping bans and wholesale visa cancelations, and no one can pretend to know what will happen next, or the outcome of various legal challenges. But that is not all you have to contend with. Far less attention grabbing, but still crucial to the outcome of your immigration application, are the many changes happening at the USCIS. You path to citizenship may not be as easy as you thought. Many people assume that marrying a US citizen will automatically make them a citizen too. Unfortunately, it’s not so easy. Nor does having a “green card” let your parents into the country – you have to be a US citizen to apply for green cards for them. There is also a complex legal maze around past crimes and offences when it comes to immigration. An aggravated conviction from years ago could lead to deportation, but certain offences may not bar you from applying for US citizenship. The immigration progress can be a lengthy one, so it is important to get everything right from the start. You need to seek competent immigration advice to give your application the best possible chance. Whether you are applying for yourself, your family, or on behalf of a company, an immigration attorney can identify possible issues that may arise, and guide you through the forms and other paperwork that are such a large part of the immigration process. An immigration attorney’s experience with the different stages of the process can also greatly aid your peace of mind. What will you do when you get a confusing letter from the Immigration Service or the Department of Homeland Security? Being able to talk to a professional who can tell you in plain language how to respond to an official letter will make the whole process far less stressful.